I love charms and when I saw this skull charm I just had to use it somehow. 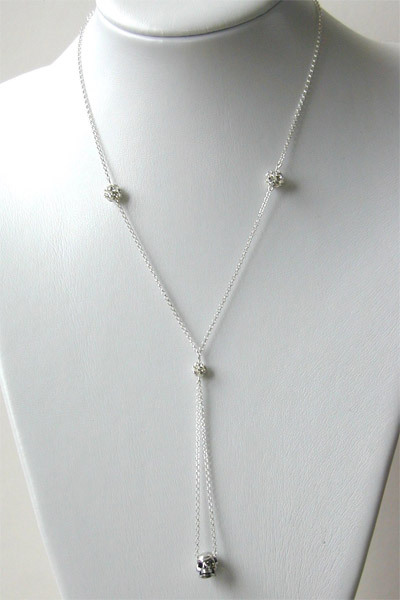 So, this is what I came up with.I tried to keep the colour to a minimum so I used sterling silver chain.For us glamour girls I added swarovski crystal rhinestone spheres to the 20" chain. The focal point is a 3 inch chain drop,at the end is a fantastically detailed pewter skull charm. With the pirate/skull theme still going strong or if you are a glamorous gothic, this necklace combination will look fantastic equally with evening wear or jeans and t-shirt.